You can change the name of any one of your roadmaps at any time. There are two ways to rename a roadmap: from your roadmap home and from the roadmap itself. 2. In the My Roadmaps tab, select the roadmap you want to rename. 3. On the Roadmap toolbar, click the Rename icon. TIP: If the icon is grayed-out, you don't have permission to rename the roadmap (see Who can rename a roadmap? below). 4. 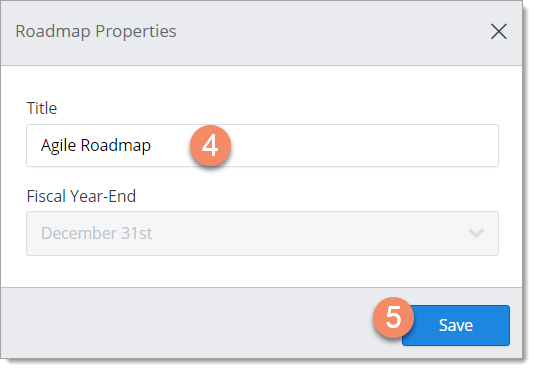 In the Roadmap Properties dialog, enter a new name (Title) for the roadmap. 2. In the dropdown, select Rename Roadmap. TIP: If the selection is grayed-out, you don't have permission to rename the roadmap (see Who can rename a roadmap? below). 3. In the Roadmap Properties dialog, enter a new name (Title) for the roadmap. Who can rename a roadmap? You can rename a roadmap if you are the Owner or the roadmap has been shared with you as an Editor. If a roadmap has been shared with you as a Viewer, you have view-only access and can't change the roadmap's name. What happens when you rename a roadmap? When you rename a roadmap, all users who share the roadmap (Editors and Viewers) will see the new name. This could cause some confusion, so we recommend that you rename a roadmap only if it's absolutely necessary.